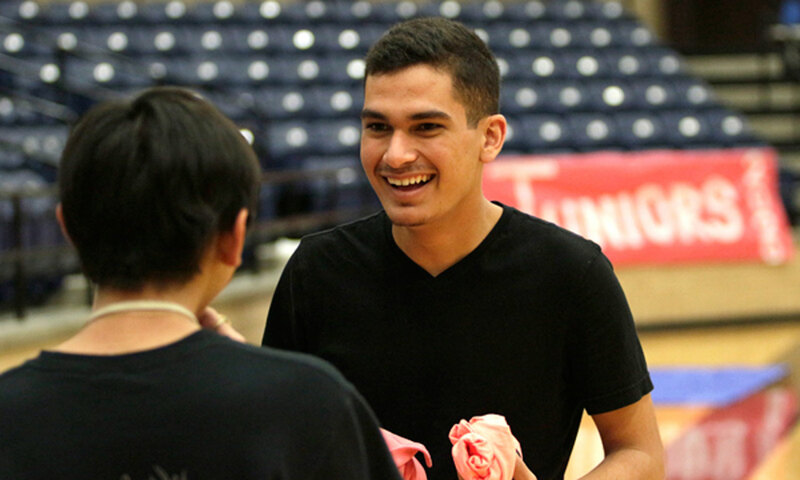 Orlando Morales, 12, discusses how to set up a pep rally with a fellow Student Council member. As senior Orlando Morales trudges into work for another long shift as a host, satisfaction flows over him. He realizes he works not only for the money, but also for experience. He resembles what some would describe as a ritual; school in the morning, tennis in the afternoon, work at night and extra curriculars somewhere in between too. “The work itself is not stressful, but it is stressful trying to maintain good grades, stay in clubs, and organizations, play sports, and still try to find a way to socialize with friends and family,” Morales said. Morales works at least 24 hours a week at On the Border in Mansfield. He tries to manage a healthy lifestyle, social life, schedule and getting more than four hours of rest each night. Morales says he manages his time to balance the workload of school and his job. He recommends high school students get a job early on. “Getting a job while in high school is something I definitely would recommend to prepare you for what’s to come later on in life,” Morales said. According to professionals at College Board, students who work gain more confidence and possess better time management skills than students who do not work. In addition to a paycheck, a part-time job can provide both training and experience. From the perspective of a student who does not work at all, junior Jonathan Segujja believes he has more time on his hands and can participate in more rigorous activities such as football. He used work at an auto shop, but quit a couple months in. “My job was very stressful because I worked long hours while playing football too, and the work I had to do was strenuous and draining,” Segujja said. Senior Brooke Session works at Soulman’s Barbeque, her church’s nursery and on days she has off she babysits a special needs child. Because of her hectic work schedule, some nights Sessions doesn’t get home until 10 or 11 p.m., where chores await her. She sacrifices her social life for work and often turns down hanging out with friends. She completes her homework and chores early on so she has time for to other activities. Going from school to extracurricular activities and then to a job means students have to do homework late at night, or in some cases, work ahead during the weekends to ensure they complete everything for the coming week. They remain hopeful as they view their check every pay period.